Ride the Fire! Let It Out! 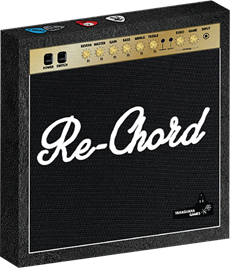 Become the budding guitarist and hone your musician's craft by playing various songs in Re-Chord - a new guitar-themed light euro game. In Re-Chord guitarists each have a hidden secret color which only they know until the very end of the game. There are three options per turn but the main action is choosing a pick from either the public draft pile or the bag, then deciding where to place it. Each pick has a power relating to the board or other picks which creates intense strategic choices. Guitarists attempt to get the most of their color picks onto each fret of the board by the time scoring is triggered. In addition to gaining popularity via area control, players have cards with real guitar chords on them which they attempt to score based on certain pick placements. Play resumes until the first four frets are full and the player with the highest total popularity score wins. Re-Chord is already funded on Kickstarter, so the best way to get this game is to become a backer.